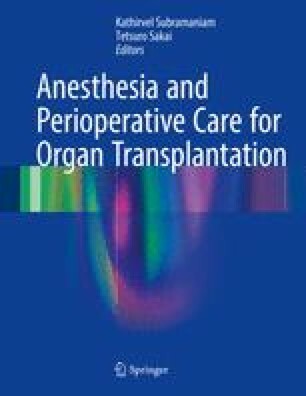 Perioperative management of patients undergoing lung transplantation (LTx) is complex and requires close coordination between anesthesiologists, surgeons, perfusionists, and critical care physicians. Thorough preoperative evaluation, careful anesthesia induction, intensive intraoperative monitoring, meticulous titration of anesthetic and vasoactive medications, and clear communication with the surgical and postoperative care team are essential. LTx is now most frequently performed without extracorporeal support, requiring patients with end-stage lung disease to be subjected to extended periods of one-lung ventilation. The decision to implement extracorporeal support is a clinical one, taking into account preoperative information and intraoperative stability. Intraoperative transesophageal echocardiography plays an important role in hemodynamic management and the early detection and management of complications. Primary graft dysfunction is a common source of morbidity and mortality and requires optimal supportive care by the peri-operative team. Postoperative pain management with epidural block may facilitate recovery after LTx.